I think I have an irrational fear of bears. For many years, and more times than I can count I have had vivid nightmares of being attacked by grizzly bears. Though I've never been killed by one in a dream, they are always hunting, or chasing me down with that intent. I've always wondered if this was just a weird twist of my subconcious, or if in fact such dreams mean something. So obviously I had to paint one, ideas of how to go about it have been floating around in my head for years now. 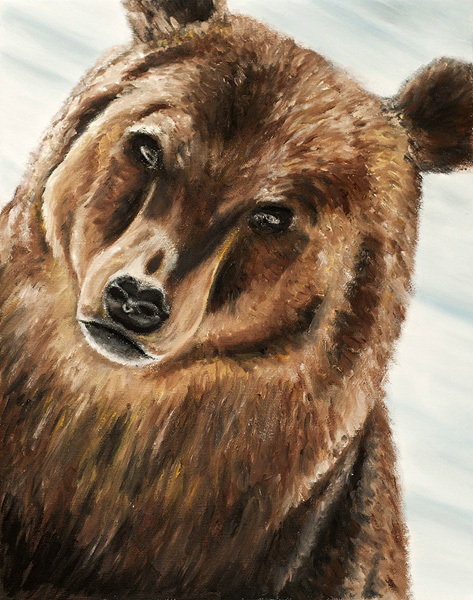 I didn't really want to paint a bear in full attack mode as that seemed too cliche. Instead I went with a more neutral expression but used an unnatural angle to impart a feeling of unease.